On the 2nd of June 1971, the most glorious page was written in the history of Panathinaikos Football Club. PAO FC having beaten great football clubs of Europe played against the fantastic team of Ajax F.C. in the final of the European Champions' Cup in the Wembley Stadium. 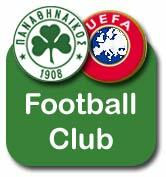 Panathinaikos made a great performance but eventually our team lost by 2 to 0. Irrespectively of the outcome of the match, the recollection of that unforgetable day remained, and it still does, vivid in all the "green" fans' minds. For that glory days and many more browse thorugh this section! 2-1 in Luxemburg, on 16. 9. 1970. Players: Ikonomopoulos, Tomaras (86' Kapsis), Sourpis, Kamaras, Vlachos, Eleftherakis, Domazos, Filakouris, Grammos, Antoniadis, Kalligeris (80' Deligiannis). Scorers: 6' Antoniadis, 35' Eleftherakis(2-1). 5-0 in Athens, on 30. 9. 1970. Players: Ikonomopoulos, Tomaras (46' Mitropoulos), Kamaras, Sourpis, Vlahos, Eleftherakis, Domazos, Filakouris, Grammos, Antoniadis, Kalligeris (46' Gonios). Scorers: 17' Eleftherakis, 27', 30', 37', 58' Antoniadis. 3-0 in Athens, on 21. 10. 1970. Players: Ikonomopoulos, Tomaras, Sourpis, Kamaras, Vlachos, Eleftherakis, Domazos, Filakouris, Grammos, Antoniadis, Kalligeris (75' Deligiannis). Scorers: 3' Domazos, 55' Antoniadis, 88' Deligiannis. 1-2 in Bratislava, on 4. 11. 1970. Players: Ikonomopoulos, Tomaras, Kamaras (46' Mitropoulos), Sourpis, Vlahos, Eleftherakis, Domazos, Filakouris, Grammos, Antoniadis, Kalligeris (75' Deligiannis). 1-1 in Liverpool, on 9. 3. 1971. Players: Ikonomopoulos, Tomaras, Sourpis, Kamaras, Vlachos, Eleftherakis, Kapsis, Domazos, Filakouris, Grammos, Antoniadis, . 0-0 in Athens, on 24. 3. 1971. Players: Ikonomopoulos, Tomaras, Kapsis, Kamaras, Sourpis, Vlahos, Athanassopoulos, Domazos, Filakouris, Grammos, Antoniadis. 1-4 in Belgrad, on 14. 4. 1971. Players: Ikonomopoulos (72' Comstantinou), Tomaras, Sourpis, Kamaras, Vlachos, Eleftherakis, Kapsis, Domazos, Filakouris, Grammos, Antoniadis, . 3-0 in Athens, on 28. 4. 1971. Players: Constantinou, Tomaras, Kapsis, Kamaras, Sourpis, Vlahos, Kalligeris (54' Athanassopoulos), Domazos, Filakouris (Chatziandreou), Grammos, Antoniadis. Goals: 1, 55' Antoniadis, 63' Kamaras. 0-2 in London, on 2. 6. 1971. Players: Ikonomopoulos, Tomaras, Vlachos, Eleftherakis, Kamaras, Sourpis, Grammos, Filakouris, Antoniadis, Domazos, Kapsis. Scorers: 41' Mavridis, 43' Rotsa / 69' Repp. Scorers: 43' Charalampidis, 88' Tarasis / 19' Totei. Scorers: 6', 27' McGahey, 10' Maxwell / 30' Saravakos, 32' Rotsa, 64' Antoniou. Scorers: 44', Dimopoulos Th., 78' Saravakos / 10' Nilsson, 53' Holmgren. Scorers: 4' Stimac / 56' Boreli. Scorers: 17' Georgiadis Ch. G., 30', 46' Warzycha / 89' Ntoram . Scorers: 1' Alexoudis, 38' Georgiadis S. G.